Roasted cashews not only possess a subtle yet delicious taste, but they are also a protein packed treat. 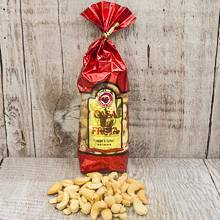 These freshly roasted cashews are a delight, whether eaten alone or mixed with other nuts. They are great for cooking as well. 10 oz. packaged in a gold striped gift bag.